[N8Mcnasty] is a HVAC tech who works on some big machines. One of his charges is a Carrier 19EX Chiller, rated at 1350 tons of cooling. 1 ton of cooling = 12,000 BTU. This particular chiller contained an odd LCD screen. It used a fiber optic bundle and a halogen light for backlight illumination. The system worked fine for over a decade. Now though, the halogen bulb has begun melting the glue on the fiber bundle, causing a dim display. The display in question shows some very important operating parameters, such as oil temperature, current draw, and process temperatures. Since they couldn’t easily see the display, the machine’s operators weren’t running the machine, placing stress on the other chillers in the building’s physical plant. [N8Mcnasty] tried repairing the bundle, however the glue kept melting. A replacement display was no longer available, meaning that the entire chiller control system would have to be upgraded to a newer system. The new control system uses different sensors than the old one. This is where things start getting expensive. Replacing the sensors would also require draining the 15-20 gallons of oil, 4500 lbs of R134a refrigerant, and bringing the whole system down for almost two weeks, a $20,000 job. Rather than go this route, [N8Mcnasty] found an alternative. LED’s have come a long way since 1996, when the chiller was built. He simply replaced the halogen bulb with an LED and appropriate resistor. [N8Mcnasty] was even able to reuse the halogen bulb bracket. A bit of heat shrink tube later, and the fix looks like it was a factory option. He’s documented his fix here on reddit. [Logi.cals], a German software company focused on process, automation, and facilities planning has devised an automated wine decanting machine to demonstrate its logi.CAD 3 PLC programming tool. Sommeliers use these simple machines to handle heavy, expensive bottles of wine. [Logi.cals] added sensors and a stepper motor to a very nice looking specimen and automated the decanting process with a Raspberry Pi. The outstanding feature of this design is the built-in redundancy. A pair of micro switches detect the presence of both a bottle and a glass. Failing these, a load cell is there to weigh the bottle, reporting naturally whether one is present. The load cell also plays a part in monitoring the liquid level in the bottle, as do capacitive sensors that register the wine flow. The design also includes strain gauges that measure the weight in the glass as well as the liquid level. To bring it full circle, they also verify that a glass is present. [Logi.cals] used two expansion boards, the Quick2Wire interface with an I²C analogue board and the PiFace. The I²C analogue board takes information from the strain gauges over its ADC, and the Quick2Wire communicates with the load cell’s measurement amplifier over the serial connection. The PiFace handles the remaining sensors and the stepper motor, and provides high voltage protection for the Pi. If you’re fresh out of heavy, expensive bottles of wine but have some cheap ones lying around, you could use a Pi to make them dance. Developed on Hackaday: We Have Pixels! It has been a while since we kept you informed about the current state of the Mooltipass project. Well, several days ago we finally received the PCBs we got produced at Seeedstudio. Keep in mind that this first version (shown in the picture above) is only meant to check that the chosen components can suit our needs while our mechanical contributors work on their designs. Moreover, we may add empty footprints for our readers that may want to hack the device. After a few hours of soldering and a few days of coding, we finally got a basic firmware running. The OLED screen is easily readable and has an amazing contrast (the picture doesn’t do it justice). So far we checked all basic functionalities of the on-board components and it’ll still take a few days/weeks to be certain that we can settle with them. We are therefore starting to ship a few platforms to the firmware developers that want to work on the core functions of the Mooltipass. 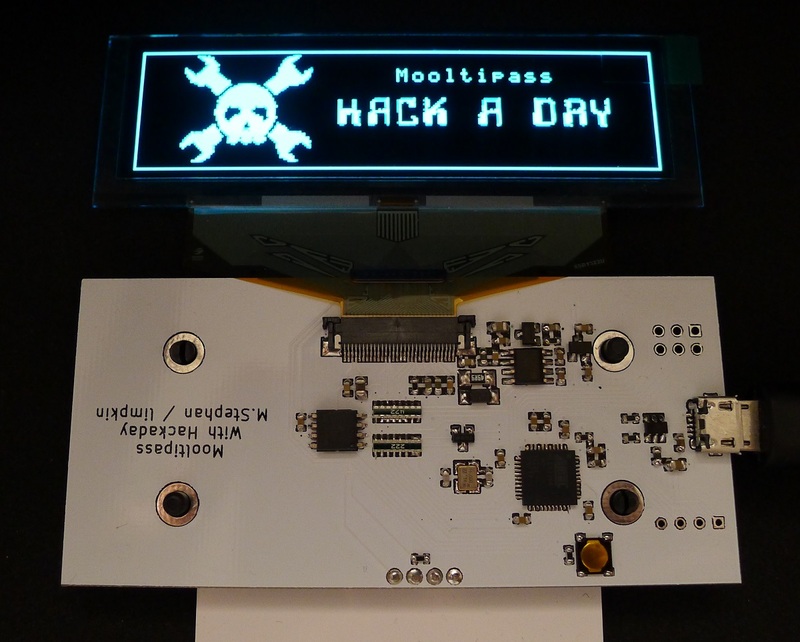 So if you’re an experienced C developer and have some spare time, you may get onboard by contacting me at mathieu[at]hackaday[dot]com or by joining the Mooltipass Google Group. In a few days we will publish the designs that our mechanical guys came up with and we’ll ask you to let us know which ones are your favorites. Depending on how things will go, we may produce PCBs for several of them to select our final design based on user experience and ease of use. We look forward to hearing your feedback in the comments section below! [Horiken Engineering], which is made up of engineering students at the department of aerospace at the University of Tokyo have developed an autonomous quadcopter that requires no external control — and its tiny. By using two cameras and a sonar sensor, the quadcopter is capable of flying by itself due to its ability to process the data from the on-board sensors. To do the complex data processing fast enough to fly, it is using a Cortex-M4 MCU, a Spartan-6 FPGA, and 64MBs of DDRSDRAM. It also has the normal parts of a quadcopter, plus gyros, a 3D printed frame and a 3-axis compass. The following video demonstrates the quadcopter’s tracking ability above a static image (or a way point). The data you see in real-time is only the flight log, as the quadcopter receives no signal — it can only transmit data. Just over a year ago, [Bunnie Huang] announced he was working on a very ambitious personal project: a completely open source laptop. Now, with help from his hardware hacker compatriot [xobs], this laptop named Novena is nearly complete. Before setting out on this project, [Bunnie] had some must-have requirements for the design. Most importantly, all the components should be free of NDA encumbrances. This isn’t an easy task; an SoC vendor with documentation sitting around on their servers is rare as hen’s teeth, and Freescale was the only vendor that fit the bill. Secondly, the entire laptop should be entirely open source. [Bunnie] wasn’t able to find an open source GPU, so using hardware video decoding on his laptop requires a binary blob. Software decoding works just fine, though. Furthermore, this laptop is designed for both security and hardware hacking. Two Ethernet ports (one 1Gbit and the second 100Mbit), a USB OTG port, and a Spartan 6 FPGA put this laptop in a class all by itself. The main board includes 8x analog inputs, 8x digital I/O ports, 8 PWM pins, and a Raspberry Pi-compatible header for some real hardware hackery. As for the specs of the laptop, they’re respectable for a high-end tablet. The CPU is a Freescale iMX6, a quad-core ARM Cortex-A9 running at 1.2 GHz. The RAM is upgradeable to 4GB, an internal SATA-II port will easily accommodate a huge SSD, the ability to use an LCD adapter board to run the 13-inch 2560×1700 LED panel [Bunnie] is using. The power system is intended to be modular, with batteries provided by run-of-the-mill RC Lipo packs. For complete specs, check out the wiki. Despite the high price and relatively low performance (compared to i7 laptop) of [Bunnie]’s laptop, there has been a lot of interest in spinning a few thousand boards and sending them off to be pick and placed. There’s going to be a crowd funding campaign for Novena sometime in late February or March based around an “all-in-one PC with a battery” form factor. There’s no exact figure on what the price of a Novena will be, but it goes without saying a lot will be sold regardless.